A local theater production of “To Kill a Mockingbird,” performed for schoolchildren in the Monroe County Heritage Museum in Monroeville, Ala., in 2015. That’s how Scout Finch describes the steadfastly Southern setting of Harper Lee’s beloved novel, “To Kill A Mockingbird.” Maycomb is a fictional city, but it’s based on Lee’s birthplace and childhood home of Monroeville, in Monroe County, Alabama, where Lee died on Friday. Monroe County was the perfect model for the setting of the Depression-era novel. According to 1930 census data, farmers like the novel’s Cunningham family made up 74 percent of the county.1 Monroe was about half black, half white, but whites were better off by a variety of a measures. While Scout’s father Atticus read to her every night, 25.8 percent of the black population was illiterate. Only 3 percent of the white population couldn’t read. 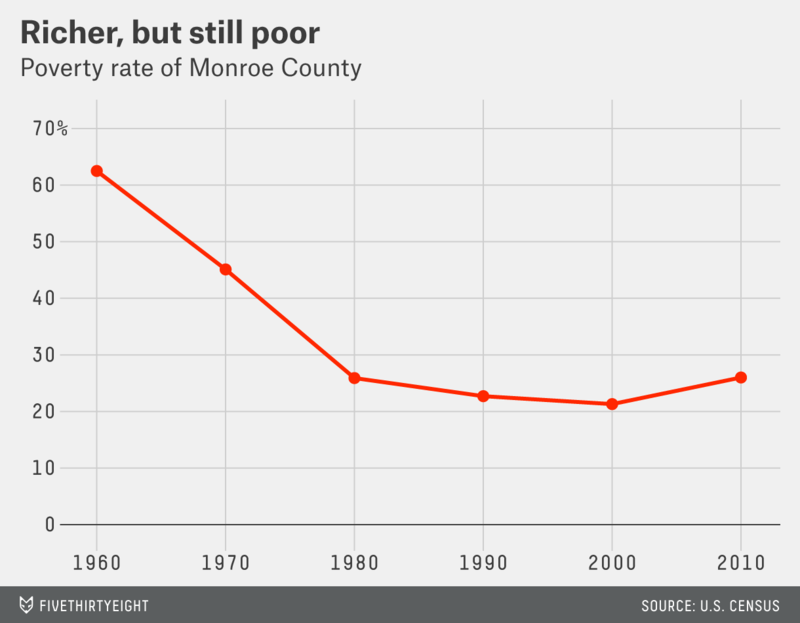 Eighty-four years later, Monroe County has become smaller, whiter and richer, but the racial disparities Lee illustrated in her book still exist. We dug up the census data from 1930, when the book was set; 1960, when the book was published; and 2014, the most recent year for which data is available. The racial income gap appears to have narrowed but remains wide. In 2014, median household income for white families in Monroe County was $38,188; for blacks it was barely half that, at $18,584. Equivalent data isn’t available at a county or even state level for 1960, but in the South as a whole, the typical non-white family earned the inflation-adjusted equivalent of about $20,000 in 1959, one third of the amount earned by the typical white family. And finally, what ultimately shattered Scout’s childhood innocence was the wrongful jury conviction of Tom Robinson, a black man, whom Atticus defended. Data on wrongful conviction — and certainly the kind of willfully wrongful prosecution depicted in the book — doesn’t exist, for obvious reasons. But more than half a century after To Kill A Mockingbird was published, issues of race and the criminal justice system remain central to the national conversation, and there have been widespread protests around the country at the way black citizens are treated by the law enforcement system. According to data from the Sentencing Project, the incarceration rate of blacks in Alabama is three and a half times as high as it is for whites. That disparity is among the smallest in the country. CLARIFICATION (Feb. 22, 10:55 a.m.): An earlier version of this article failed to note that the income figure for non-white families in the South in 1959 was adjusted for inflation. The median non-white income that year was $2,520, which is about $20,000 in 2014 dollars when adjusted for inflation. The 1930 Census data was provided by the National Historical Geographic Information System at the University of Minnesota. Monroe County data is from the American Community Survey, 2009-2014. Alabama poverty rates for 1960 and 2014 are calculated using American Community Survey and decennial Census data from IPUMS-USA, University of Minnesota.